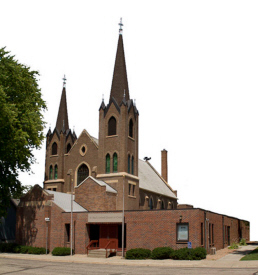 Do you have photos, historical accounts or other items pertaining to the Plato area? Would you like to share this historical information with the world? 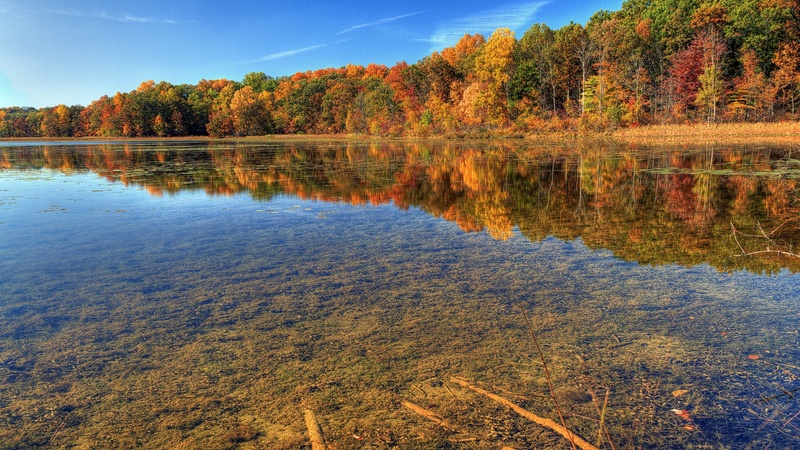 LakesnWoods.com would like to publish your Plato photos (current or historical) or historical accounts on this website. Original materials can be returned and your privacy will be respected. 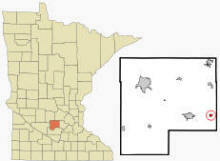 Plato is a city in McLeod County, Minnesota. U.S. Route 212 serves as a main route in the community. 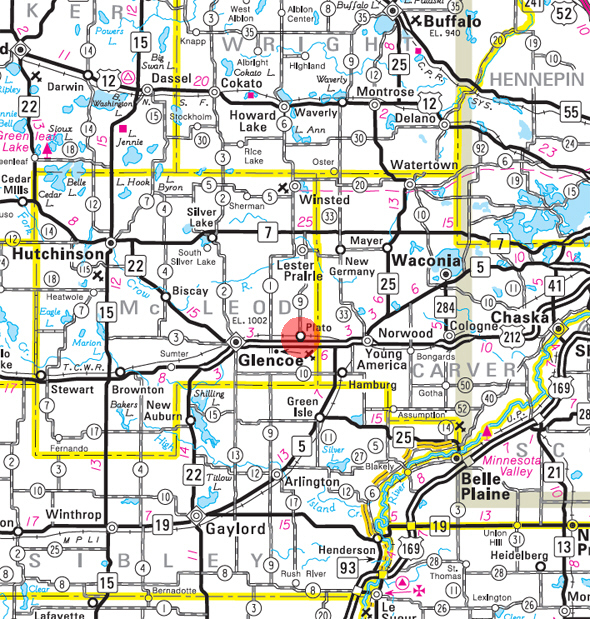 According to the United States Census Bureau, the city has a total area of 0.36 square miles (0.93 km²), all of it land. The elevation is 997 ft (304 m) above sea level. At the 2010 census, there were 320 people, 139 households and 97 families residing in the city. The population density was 914.3 inhabitants per square mile (353.0 /km2). There were 146 housing units at an average density of 417.1 per square mile (161.0 /km2). The racial makeup of the city was 98.1% White, 0.3% Native American, 0.6% Asian, and 0.9% from other races. Hispanic or Latino of any race were 0.9% of the population. There were 139 households of which 23.0% had children under the age of 18 living with them, 61.9% were married couples living together, 4.3% had a female householder with no husband present, 3.6% had a male householder with no wife present, and 30.2% were non-families. 23.7% of all households were made up of individuals and 8.7% had someone living alone who was 65 years of age or older. The average household size was 2.30 and the average family size was 2.72. The median age was 44.6 years. 18.7% of residents were under the age of 18; 3.7% were between the ages of 18 and 24; 28.2% were from 25 to 44; 31.6% were from 45 to 64; and 17.8% were 65 years of age or older. The population was 50.6% male and 49.4% female. 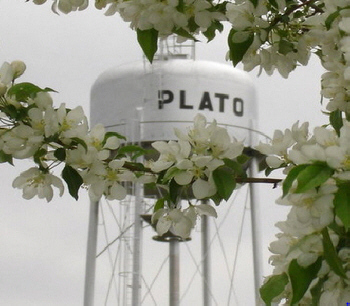 PLATO, a city in sections 11 and 14, Helen Township, bears the name of a renowned Greek philosopher (d. 347 B.C. ), who was a disciple of Socrates and the teacher of Aristotle. This is also the name of small villages in New York, Illinois, Kentucky, and Missouri. 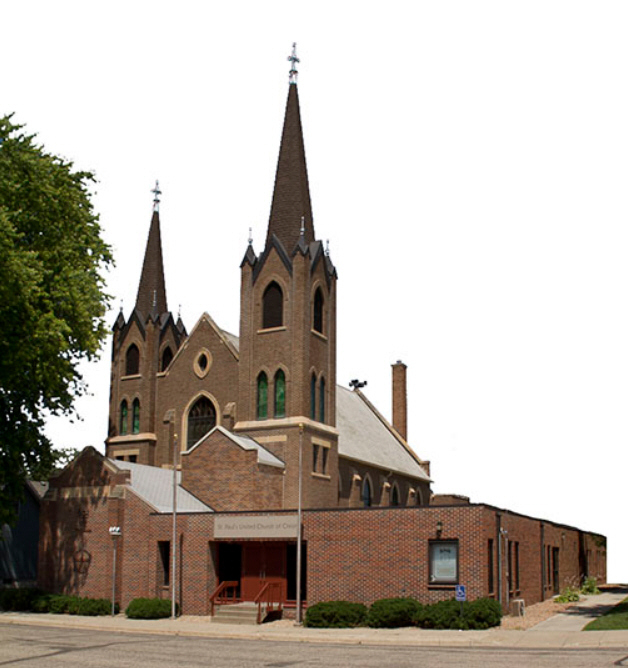 The city was incorporated as a village January 1, 1889; its post office, established in 1858, was located on the north end of Kennison Lake, and when the Chicago, Milwaukee, St. Paul and Pacific Railroad came through the township, the village moved to be near it. Crown Industries continues to manufacture hydraulic powered single piece (tip up door, one piece door, or hydraulic overhead doors), aircraft bi-folding, cable lift bi-fold, and custom design doors for architectural, glass covered, aircraft hangars, helicopter hangers, marine storage, farm sheds / Ag buildings, residential and commercial applications. Turf and agronomics, animal products, building products, consumer products, family care products, lubrication products. Conklin Dealers Needed! Lifetime Career in marketing, management, and applying "Green" products made in America. 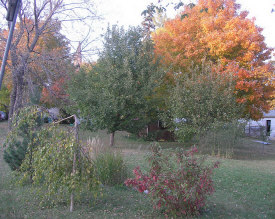 Kahnke Brothers Tree Farm is a 116-acre Minnesota nursery that specializes in trees, shrubs and perennials. This nursery is owned and operated by Kahnke Brothers, Inc.; a trusted landscape and irrigation contractor. 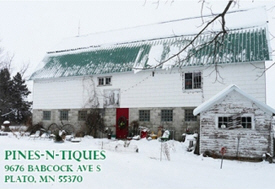 Kahnke Brothers Tree Farm is located between Plato, MN and Glencoe, MN on the north side of highway 212. You can see our nursery clearly from the highway, so be careful not to go in the ditch as we distract you with a rainbow tapestry of trees, shrubs and perennials! 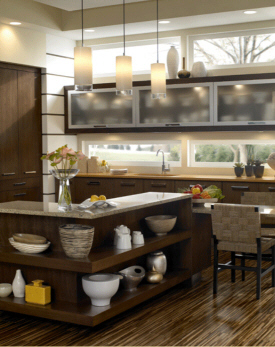 At Plato Custom Concepts, we specialize in creating unique and very functional kitchens. As our client, you will be guided through the complex world of finishes, interior options, countertop materials, hood designs and many other important details that are the value of your well-designed kitchen. With over 100 years experience we can assure you that your kitchen will be the perfect expression of your individuality and lifestyle. Plato Pines-n-tiques is a wonderful shop housed in an old restored barn 35 miles west of the Twin Cities just off Highway 212 at Plato, MN. Eighteen years ago the owners, Saundra and Howard Schaitberger, restored an 85+ year-old barn with a new roof, doors, windows, cement, electricity, heat and air conditioning, plus many other upgrades! In 2014 the barn, milk house, tool shed and original summer kitchen will be 104 years old! Next they invited dealers and consigners from all corners of MN to come and fill the 5,000 square feet with collectibles, antiques and now VINTAGE and UP-CYCLED merchandise gathered from all around the country. The endeavor has been extremely successful! 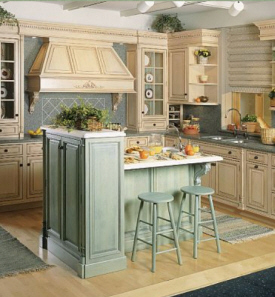 Since 1893 Plato Woodwork has earned its reputation as one of America's preeminent fine custom cabinetry manufacturers. In a world where details make the masterpiece, Plato has proven to be the master of detail for every room in your home. The Art of Transformation™ happens every time Plato cabinetry is used to turn a homeowner's dream into reality. With a vision for beauty and a passion for excellence, Plato is the intelligent choice in fine custom cabinetry. 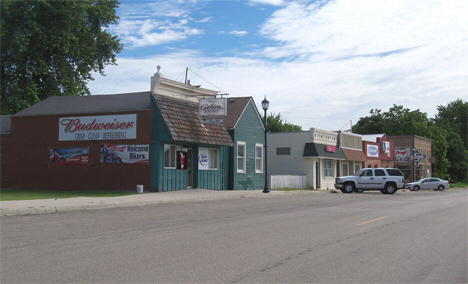 On May 30, 2014, Security Bank & Trust Co. and Security Bank Waconia merged as Security Bank & Trust Co. As a combined bank, we now have 12 locations to service you. The goal of this merger is to create a stronger community bank – offering a broad range of deposit, loan, and investment services. We value your business and remain steadfast in our commitment to providing quality customer service and support for the communities where we live and work. Thank you for placing your trust in us as your financial institution. We look forward to serving you for many years to come.